The leading online video slots developing company, Thunderkick, never stops surprising punters with their unique bursting ideas and imaginations. The well-known worldwide company is responsible for creating the Sunset Delight slot. This slot features unique gameplay as well as design. If you like trying out new slots with unique game settings, then this one will be an excellent match for you. The layout has three reels, three rows, and only five fixed betways. The developer makes it even more interesting by including wild symbols, free spins, scatter symbols and other bonus features. What makes this slot game unique from other titles is that the symbols are represented in the form of a scoop of ice cream. There is also a whopping jackpot of 1000x to cool you in the hot summer weather. The interface is sleek and designed with 3D visual graphics and animations. The betting range is pocket-friendly as you can stake from as little as 10p to a maximum of $100. Also, the theoretical return to player (RTP 96.3) is average both for beginners and experienced gamers. As it is with other Thunderkick video slots, Sunset Delight is building with HTML5 which enables it to fit on smartphones and tablets. We must admit that Thunderkick developers offer some of the most attractive video slot games. Sunset Delight slot will set you in a typical summertime, where you will always be in a happy and cheery mood. The background is simple and catchy, with the setting sun at a famous seasonal carnival. Most people in the game are lining up to be served a scoop of the delicious ice cream from the vendor. One thing that makes the ice cream vendor very popular is that each one of the ice creams is served randomly. 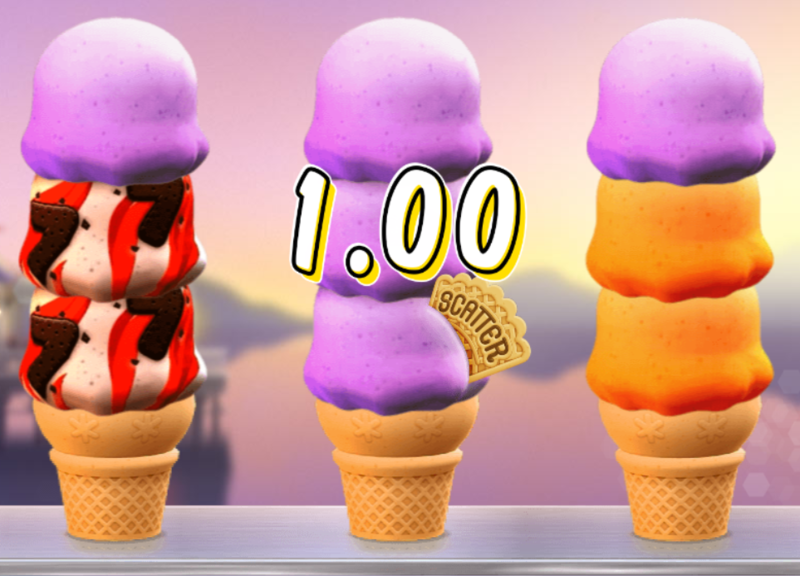 Also, a few of the ice cream flavors come with special treats like rewarding whoever grabs the cone with cash prizes. You will be delighted by the stunning colorful graphics, seamless animations and an immersive soundtrack that blends perfectly with the theme. The reels are placed on the serving tray of the ice cream stand and a beautiful view of the carnival and the setting sun. The symbols are perfect and match with the theme and the color of the game. The main symbols of the game are represented by different flavors of ice cream such as pink flavor topped with sparkles and sprinkles, chocolate chip, grape, lemon, and orange. As aforementioned, there are not standard reels in Sunset Delight video slot. Instead, you will see three different wafer ice cream cones slid on the counter before you. Each of the three will be topped with scoops of ice cream when you click on the 'Spin' function. This will what will create some reels and rows for playing. Note that there are only five pay lines which are entirely fixed and rewards from left to right. Unfortunately, there is no option for setting or adjusting the bet amount but a Chance to Chance wager that you stake. You can do this by clicking on the current bet shown or on the casino chip which will present a table of bet amounts. This will enable you to select a bet range between $0.10 up to $100 per spin. There is also the AutoPlay functions which allows you to set up to 5000 consecutive spins without interruption. Also, two separate pop up menus will display the rules and more information about the payouts, pay lines and bonus offers. All the game symbols are different flavors of ice cream, just as you would expect. They are divided into low and high-value symbols and offers different payouts. The lower value symbols are represented by the pink, red, yellow and orange colored scoops. The cones mark the high tier symbols with toppings including; cinnamon streaked with fudge sevens, a pink flavor with sparkles, chocolate caramel with bar symbols and a big blue W's. This symbol is represented by the ice cream cone with the letter 'W.' This symbol has the power to substitute for any other symbol except the scatter symbol. Land three or more of the wild symbol to receive up to 15 times you bet amount. The scatter symbol of the game is represented in the form of the wafer. As an overlaying symbol, it can showcase anywhere on the symbols. Landing three or more scatter symbols will activate the bonus game. The bonus game is a free spins feature that comes with the additional symbol to create more ways to win. They will appear as toppings on ice scoops during the free spins round. The additional '+1 Step' function will enable you to advance one level on the bet multiplier ladder and reward one extra free spin. This icon can showcase anywhere on the symbols during the bonus game. Thunderkick slots creators have earned an excellent reputation for releasing engaging games that are compatible with Android and iOS-powered devices. With the latest modern cutting edge technology such as HTML5, you will be able to play Sunset Delight slot game with high-quality graphics, smooth visual animations and flawless gameplay across all smartphones and tablets. This game is available in instant play mode, meaning, you do not have to worry about downloading software on your devices. You can play it instantly on standard mobile browsers including Chrome, Opera, Safari and Firefox. "We are Thunderkick, and we make Games." These are welcoming words on the company's website. The Stockholm based video slots developer does not need a lot of introduction to lure yours to their lobby. They boast of having a team with vast experienced individuals who are committed to ensuring that they release unique and high-end products and nothing less. The company, which was founded in 2012, operates under the Master license of Malta Gaming Authority and the UK Gambling Commission, and it is also certified to perform in many other jurisdictions. Their slot games are available at some of the leading UK online casinos such as bCasino and others.